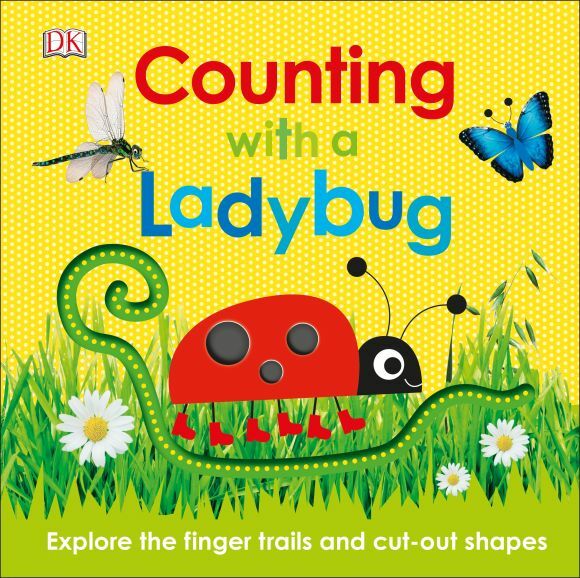 Follow tactile finger trails and cut-out shapes in this sturdy counting book for kids that helps develop your child's number skills. Twelve bright pages feature an animal-packed number rhyme to read aloud. From one little ladybug to ten noisy ducklings, preschoolers will soon be counting the garden friends as they follow the tactile trails, feel the intriguing die-cut pictures, and embark on an animal adventure. Dazzling dragonflies, greedy snails, pretty butterflies, wriggly caterpillars, green grasshoppers, little bunnies, buzzy bees, and tiny ants are all waiting to be counted in this delightful book, and as you turn each page, there are more and more little ladybugs to count, too! The lively rhyming verse aids language development and literacy, while following the finger trails and exploring the tactile pages encourages fine motor skills--helpful for pre-writing readiness. This colorful toddler counting book combines charming artwork with exciting, real-life photos that build preschool knowledge. It will appeal to toddlers' and preschoolers' imaginations as they enjoy lots of hands-on, early-learning fun. Sophie la girafe: Let's Get Counting! My First Sophie la girafe: Let's Get Counting!